The black neck wrap is done and I am already thinking about the next one. I thoroughly enjoyed working with this fine Guatemalan cotton thread (you see how I have forgotten about all the woes in the beginning!). It was fun picking up threads with the delicate Guatemalan pick-up sticks and feeling the silk supplementary wefts slide through my fingers. Maybe I will use some Guatemalan-inspired designs this time or perhaps I will invent some of my own. I got the black piece off the loom and then I was faced with fringe twisting. Would you believe I have never done this before? I have left fringes on placemats and braided the ends of other pieces. I had read the grumblings about fringe twisting from those who regularly weave scarves in the weaving forums and seen pictures of the gadgets and gizmos that have been designed to make this task less tedious. I even watched a video I had taken of my Montagnard weaving and twining teacher, Ju Nie (seen at left spinning cotton), twisting the ends of a piece she had recently taken off her backstrap loom. Ju had come to visit at friend Betsy’s house and, rather than sit idle while chatting in the living room, she pulled out a wad of stuff wrapped in paper and a woven piece of cloth and started working. The “stuff” turned out to be mushy, sticky over-cooked rice through which she drew the warp ends before rolling them on her leg and setting them in the twist. Here is the video. Ju explains that doing it on her pants is “no good” and that it works much better on her bare leg. I am guessing that her bare shin makes the best rolling surface. So, I twisted my fringe and it wasn’t as slow as I had thought…much faster than braiding, I can tell you! I added weft twining to the ends of the fabric before taking it off the loom. I think that made a nice finish. See the countered weft twining tutorial here. And then I found that scarves are kind of hard to photograph…way too long and flat and lifeless to try and stretch out in one shot so I gathered it up and threw it down many times, fiddled about and I felt that this was the best “pose” in the end. Remember this guy? I had just started the large main motif when I decided that I would not touch this until I was sure I would have enough time to stick with it and finish it. 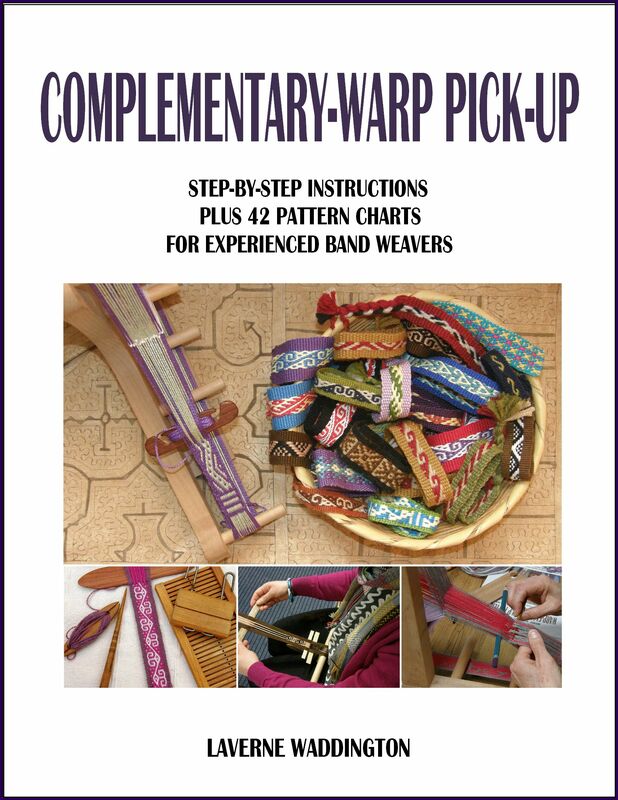 When doing pick-up, I think it is best to do a pattern all in one go rather than leave it sitting while I travel. If I leave a piece for a long period of time, I can almost see the place where I left off and picked up again. Perhaps I sit a little differently, apply a little bit more or less tension, beat differently…I don’t know…something changes. So, now is the time to get down and finish this piece. I welcome the opportunity to have my hands in there and full of threads again. I am not a pick-up stick kind of gal, unless a particular technique or yarn really demands it. I like to hold and pick and drop threads with my hands. Perhaps it’s because that is the way my first Peruvian teachers showed me. I have been shown and I have willingly tried other ways but I always come back to just using my hands. Here is a weaver creating a belt patterned with supplementary warps. It is a narrow piece and so it is easy for her to simply insert her hand between the warp layers to do the pick-up. I was finally successful in uploading the video of this weaver at work. You can see how she does her pick-up as well as see the two-stick method she uses for opening the heddle shed. She has a forked stick in the warp….one prong is her shed rod and the other prong holds a second cross. Grasping and twisting the fork, while leaning forward to relax tension, helps her to smoothly open the heddle shed. Both weavers work equally fast, don’t you think? So, on I go with hands full of threads. This is the third piece in my red-white-and-black wall hanging series. This one has patterns which have been inspired by the si’ira belts woven by the Wayuu people of Colombia and Venezuela. Since starting this project, I got to go to Holland and meet Mirja Wark who spent years studying, collecting and cataloging these belts as well as writing a book describing the weaving, braiding and twining techniques used. These are belts that Mirja herself wove while studying. You can see the “cow’s nose” pattern at the bottom of the blue, pink and green belt that I used in my wall hanging. The large motif that I will use in the center has been very much adapted to fit my piece and uses just certain elements of the Wayuu patterns as inspiration. There are a lot of threads to pick and, until I things get rolling, I am very much clinging to my pattern chart. Thank you, Terri, for introducing me to removable highlighter tape which works like a dream! So I will be parked in front of that piece for some time while taking breaks to re-spin the Malabrigo yarn, plan supplementary-weft patterns for the discontinuous-warp piece for which the Malabrigo is destined, ball up that large skein of Guatemalan purple cotton, sketch some patterns for the purple scarf project, plan piece number four in the wall hanging series…maybe ikat? ?…do I dare? And I am folding this sampler piece this way and that to see if something useful can be made of it. It’s still on the loom and there is room for more pattern experiments. Let me show you some things that Ravelry members and students and friends have made. It is a strange coincidence that three people decided to edge pieces of clothing with woven bands. Janet decorated a pair of felted slippers that she made, Laura edged gloves (and also made a camera strap and headbands) and Julia edged a couple of tiny shadow-weave kimonos with a pebble weave band. Three gorgeous projects! (I am in love with that shadow-weave cloth, by the way…it takes four shafts…I would like to try it). I will leave you with the happy twin recipients of the wee kimonos…Julia’s grand nieces! There is no formula that will suit all weavers…that is, “x” number of strands of such-and-such a supp weft material will give sufficient coverage with such-and-such warp thread. 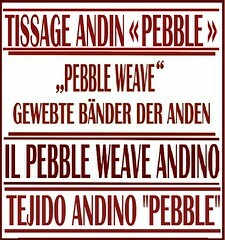 All weavers are different in the way they handle their warps. For example, some weavers put a lot more tension on their warp than others. This means that they have fewer picks per inch than others because the warps are pulled so tight that they can’t bend over and under the wefts as easily as they do for weavers who use less tension. This means that a certain amount of supplementary weft material won’t give the same amount of coverage for those weavers as it does for others who use less tension. Another case…some people simply don’t beat hard enough when using supplementary wefts. I beat hard and really mash the weft into place…not “wham wham” beating…more like placing the beater right at the weaving line and pushing against the weft hard with a rocking motion. Other people pull too tightly on the supplementary weft. It has to be fairly relaxed in the shed to allow it to spread and cover the surface. As an experiment, pull your supplementary weft tight once you have changed sheds and see what happens. It will flatten and narrow and not give good coverage. You have to find the balance between thread that is relaxed enough in the shed and bumps at the sides, where the weft turns, that are not too big and loose. These are all things that come with trial and error and experience. 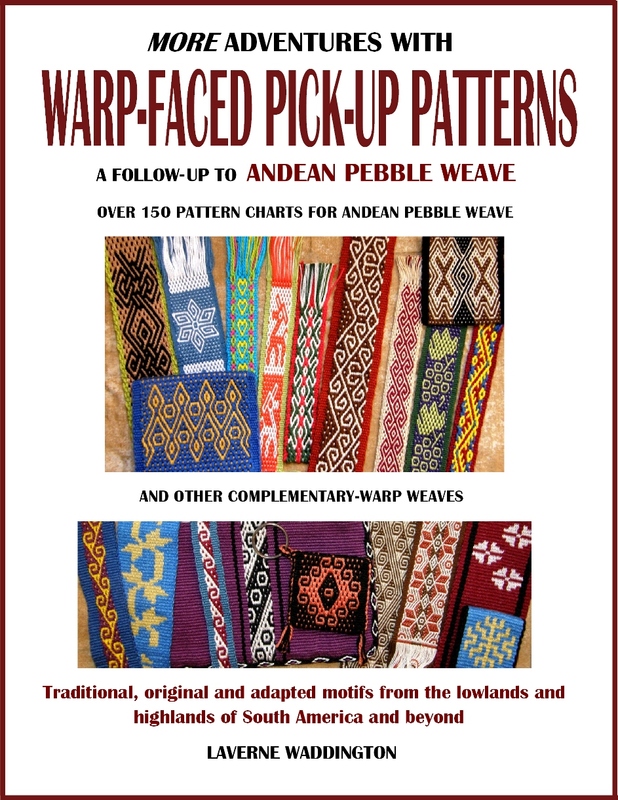 It might be that you need to use more supp weft material or it could be one of the other factors I have mentioned here. I often use thread that is similar to #3 and #10 crochet cotton. It is Brazilian cotton that I get here in Bolivia. I have used two strands of embroidery floss with the “#3” and one and a half with the “#10”. This gives people an idea of where to start and what to try but, as I said, every weaver is different. ETA My first Guatemalan teacher combed the strands of her supp wefts with the point of her pick-up stick so that they lay next to rather than on top of each other. They didn’t move with handling…the floats are not long enough to cause that to happen. I did the same with the six strands of 60/2 silk on my current project. i absolutely fell in love with your black scarf, can’t wait to see the new one. Happy New Year to you too, Yonat. Looking forward to catching up this spring. Laverne, the finished black scarf is stunning! And that “throw down” method of photography for scarves is brilliant. I must try that next time. The rich purple will be very beautiful. You continue to inspire me to keep moving forward. So many weaving projects to try. So much fun. And boy-o-boy do the weaver creating a belt patterned with supplementary warps and the gentleman from Chahuaytire also weaving supplementary-warp patterns work fast. For a minute I thought the video was on fast forward! Thank you, Julia! You are right…those videos do really look like they are on high speed! I am gathering ideas for the purple scarf now. Very beautiful scarf! I hope you can do many more in 2013. Peace and Joy for the next year. Thank you Helena and a very happy new year to you too. 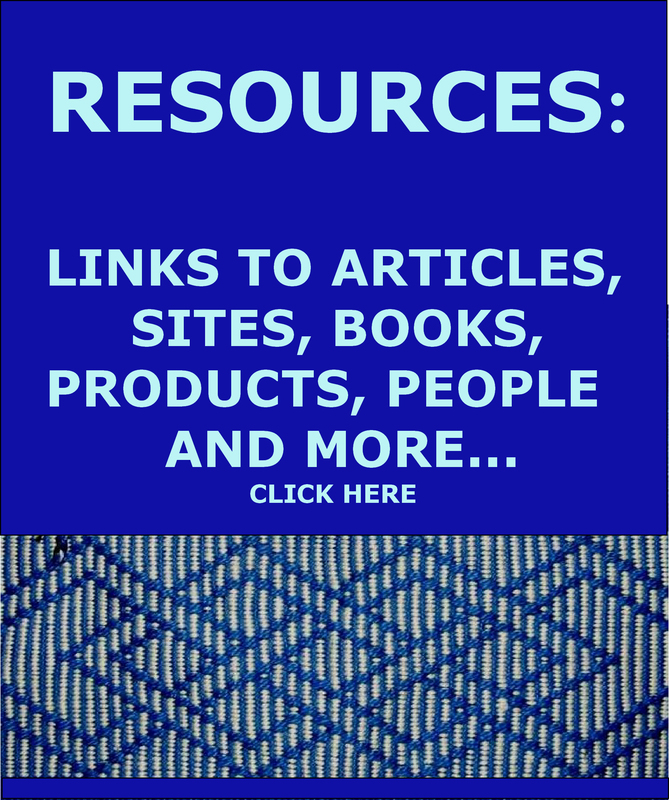 Hi Laverne, I came by your blog some days ago, while looking for information, patterns and lessons on weaving, specifically about Wayuu weaving. I lived several years in Maracaibo, Venezuela, and I totally love the gorgeous and colorful patterns they make. I recently got interested in weaving and got a Ridge Hedge Loom with which I started practicing some days ago. I know the Wayuu designs are quite complicated ( I own a backpack I bought in the Wayuu market in this city several years ago and totally love it), but in time I’m willing to learn to make them. Would you be so kind to point me to this book Mirja Wark wrote? or as many tutorials or books I could use to learn more about the Wayuu patterns? Beautiful designs you made, and I agree with everyone, the scarf is amazing! Thanks for your blog and information! The book covers the si’ira belts, their patterns and the techniques used to make them. 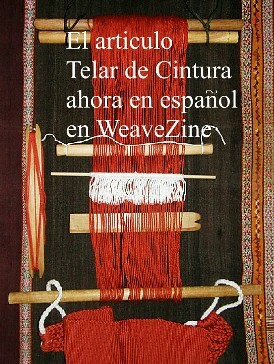 The “mochilas”, or bags created with crochet hooks, are mentioned but are not the focus of the book. There is no information on how they are constructed or their patterns. Good luck with your weaving! Hi Laverne! Happy New Year! I’m just starting weaving, and hope to learn fast and well to be able to make some simple designs based on Wayuu weaving. 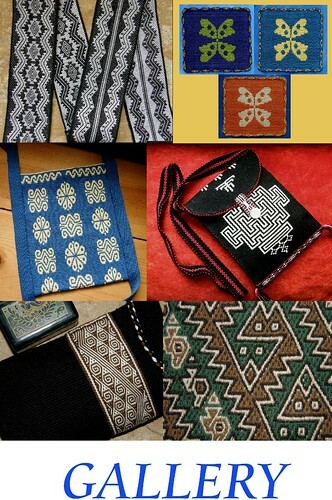 I also like the Yekuana motifs (they are specialized on basket weaving though, and they live in the jungle border to Brazil)..
I’m not interested in the “mochilas” but in the motif itself, so I can adapt it to different purposes. Hope I can. Thanks for your wishes, and may you have a wonderful year!